Fractal geometry meets jigsaw art in this mind-bending plywood puzzle. Fractal geometry meets jigsaw art in this mind-bending plywood puzzle. Unlike conventional pictorial puzzles, the challenge is to complete an interconnected but ever-shifting geometric field. Finished with a striking aniline toner, the mesmerizing composition offers a challenge to entice any puzzle-lover. Made in Grand Rapids, Michigan. My grandson began playing with solving the puzzle leaving 1/2 of it black and 1/2 finished. Hard to describe but it look very cool. 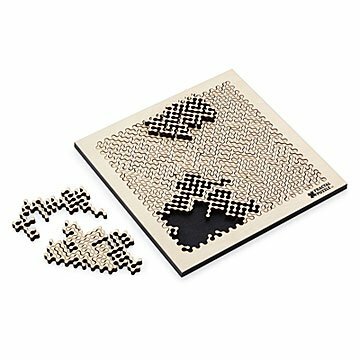 This is a super cool puzzle! This is a very unique puzzle. Very good workmanship. The pieces are not very thick, therefore you have to be rather gentle with them and handle them carefully. The one downside is that by looking at the picture and reading the description, I thought it would be rather difficult to put together - trickier and challenging. However, it really wasn't. My daughter finished it in only 12 minutes. It would be quite challenging for children maybe 9 years old and up. But I'd be afraid they wouldn't be careful enough and the pieces would get broken. There are a total of 23 pieces to this puzzle. It is completely obvious where every single piece goes. It look less than 12 minutes, while watching a movie, to solve it. Don't waste your money. It's a puzzle. My stepdad says he loves it and that it is very challenging! good puzzle to think on and leave on the table for the whole month. Very different concept for a puzzle. Can't wait for their reactions upon receiving athis gift. Sent yesterday in the mail. A perfect solution to a tradition! Easy to transport, a perfect solution for our cruise.